Many of you will have already heard the great news, but for those who haven’t, I am pleased to announce that OpenStreetMap’s annual conference will be held in Birmingham, from 6th – 8th September 2013. The conference, known as State of the Map 2013 (SotM 2013), will see 300 users converge on Birmingham to discuss everything OpenStreetMap. It’s been 6 years since the conference was last held in the UK and in that time OpenStreetMap has developed from a project with 10,000 contributors, to one of 1.05 million registered users. To reflect on this huge growth, this years theme is “Change”. Being such a big event, we are delighted that we are not alone in organising the conference. In addition to regular Mappa Mercia members, we also have the support of many other OSMers from both inside the UK and around the world. Thank-you for all your input. Boundaries, be they land ownership or administrative boundaries, form an essential part of geo-data. Was it therefore a success for the open data campaign when Ordnance Survey released the Boundary-Line product, containing all electoral and administrative boundaries, under the OS OpenData Licence? Not Quite. The problem is that boundary is the “Boundary-Line” data are not boundaries! There are two issues, and these apply to all geospatial data released as independent vector layers; scale and context. Boundary-Line is captured against a lower resolution mapping backdrop and the boundaries are captured to represent the data at a nominal 1:10000 viewing scale. The process of generalising the data may have caused some features to be moved from their true ground position for the purpose of map clarity. So scale, or to give it it’s proper name, generalisation, is the first problem we should be aware of before using Boundary-Line data in OpenStreetMap. OSMM Topography Layer currently holds the definitive and more accurate boundary information as the boundaries are mered (aligned to) real-world features on the ground. Captured at mapping scales of 1:1250, 1:2500 (for urban areas) and 1:10k (for rural). Okay, we can see that MasterMap uses a larger scale / higher resolution which helps provide more accurate data, but what is that reference to “mereing” (alignment). Mereing, is the process of establishing a boundary relative to ground features present at the time of a survey (source: ESRI). As such any boundary line extracted from a map of any resolution cannot therefore be used on its own to describe a boundary – once you extract the boundary, you loose the context provided by the rest of the map! 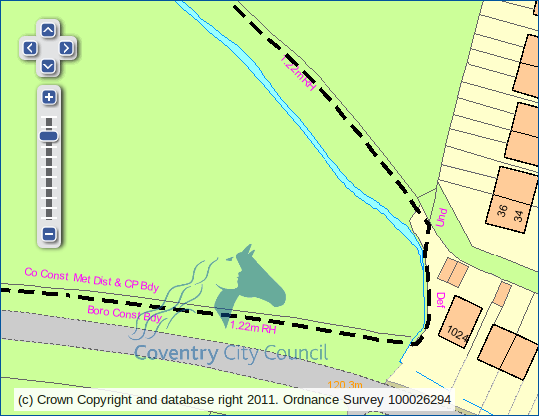 For illustration purposes only (courtesy of Ordnance Survey and Coventry City Council). 1.22m RH – RH stands for Root of Hedge, and 1.22m equates to exactly 4ft. The boundary is therefore 4ft away from the stem line of the hedge. This unusual convention comes from the presumption that landowners planted hedgerows slightly in from the edge of their land so as to not encroach on their neighbours plots. The distance differs between 3ft and 5ft depending on which parish the land lies within. Def – This is a “defaced boundary”, meaning that the original feature that the boundary was aligned to no longer exists. This was probably a hedge that was removed when the houses were built. Had the hedge roots not been removed then the boundary would be marked as “Tk H” implying track of hedge. Und – An “undefined boundary” is one where there was no real-world feature to align the boundary to when it was surveyed. For a list of abbreviations click here. Any vector extract of boundary data will be problematic due to generalisation (scale) and the loss of information about mereing (loss of context). If you are really keen on determining the exact boundary you may want to read more about boundary presumptions or go and dig out the original surveyors notes (Perambulation Cards) at the National Archives. So for OpenStreetMap should we be linking boundary ways to streams and hedges on the acknowledgement that Boundary-Line data is not perfect and we are not able to provide any certainty as to which side of the hedge the boundary actually resides on? Please leave your thoughts as comments below. In my previous post entitled “Maperitive: My first map render”, I introduced the concept of creating your own map style using the offline tool, “Maperitive”. At the time we looked at a very simple example of downloading a geographical region of OpenStreetMap data, loading it into Maperitive and drawing (rendering) your own map using the built in rendering rules. In this follow up post we will explore the idea of creating your own basic rendering rules in order to highlight specific map features. As coincidence will have it, at Mappa Mercia’s last monthly meet-up we spoke about rebooting the main mappa-mercia.org website no that our original maintainer is no longer living in the UK. I will therefore look at the gritting map as an example. Before we can get started on writing the rendering rules we must first download the required OpenStreetMap data and understand the tags – after all it is the tags that drive the rendering rules! As you can see, the web address used to download the required data is easy to understand and adapt to other uses. The geographical region is specified by “[bbox=-1.93,…] ” and the download is restricted to only ways with the tag “[maintenance=gritting]”. Finally [@meta] is used to download the additional metadata required to open the file in JOSM. For more examples, see the wiki entry for Overpass XAPI. 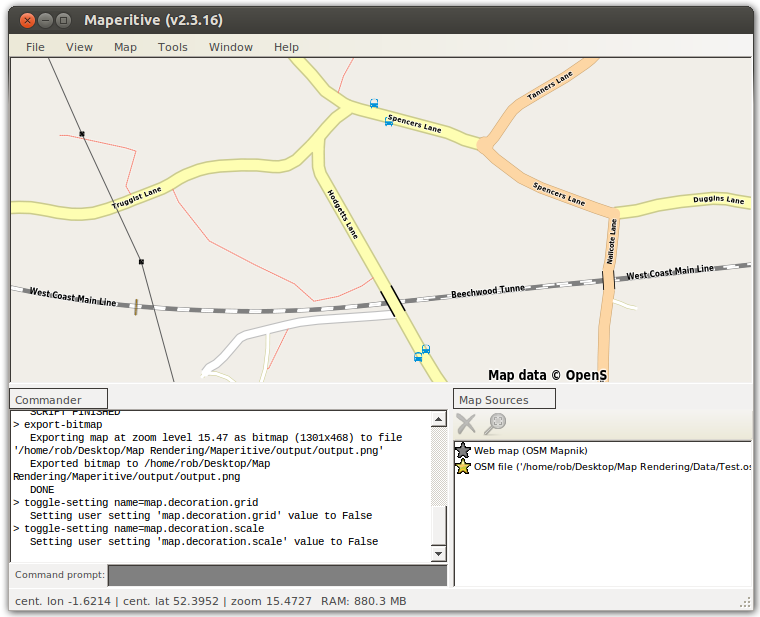 Other ways to download OpenStreetMap data can be found here. 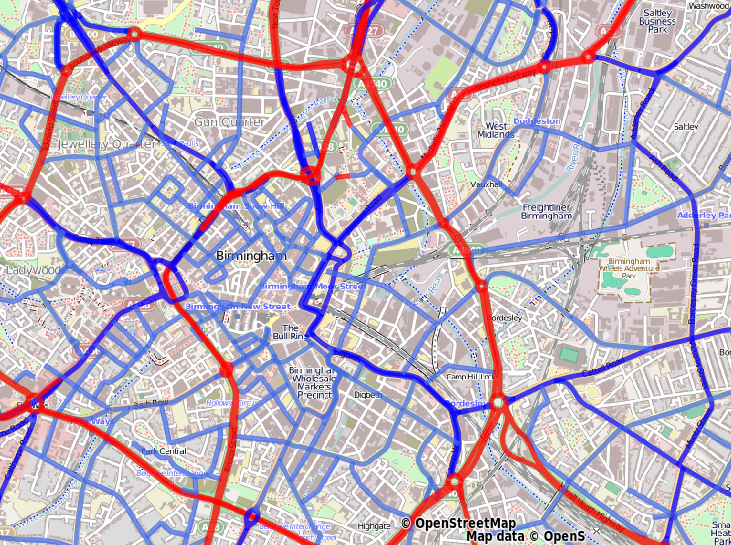 If we open the resulting “gritting.osm” file in JOSM (or if you already know the data well enough), we find that all gritting routes are tagged with a priority from 1 to 3. For example, “gritting=priority_1”. We will therefore set up our rendering rules in order to create map showing these as colour coded routes. The output map as rendered by Maperitive. Maperitive rendering rules specify what gets drawn on the map and how it gets drawn. You start writing rules by specifying “features”. A feature could be a forest, a motorway, a bench. This answers the “what?” part. After that, you specify the actual “rules” for these features. This answers the “how?” part. In the top section, we are defining that we wish to create a line feature called “gritted route” and that only ways tagged as “maintenance=gritting” belong to this group. In the lower section we define rendering rules for the feature. All gritted routes are drawn with the same line opacity, minimum zoom and line width, however we separate out line colour according to the priority tag. In my test, it would appear that any HTML colour name is allowed (?). For more on rendering rules, see the Maperitive guide.